저널명Sci Rep. 2016 Dec 15;6:39026 doi: 10.1038/srep39026. Age-associated immunological dysfunction (immunosenescence) is closely linked to perturbation of the gut microbiota. 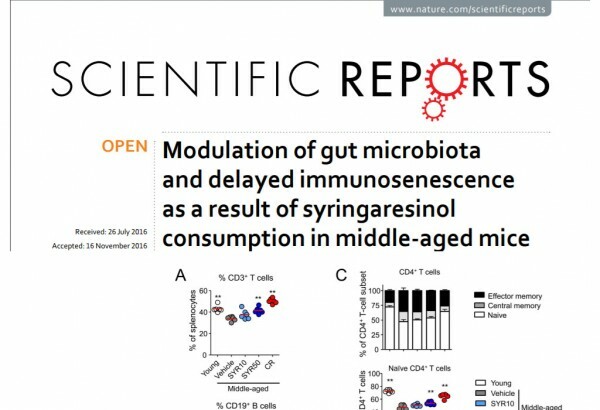 Here, we investigated whether syringaresinol (SYR), a polyphenolic lignan, modulates immune aging and the gut microbiota associated with this effect in middle-aged mice. Compared with age-matched control mice, SYR treatment delayed immunosenescence by enhancing the numbers of total CD3+ T cells and naïve T cells. SYR treatment induced the expression of Bim as well as activation of FOXO3 in Foxp3+ regulatory T cells (Tregs). Furthermore, SYR treatment significantly enhanced the Firmicutes/Bacteroidetes ratio compared with that in age-matched controls by increasing beneficial bacteria, Lactobacillus and Bifidobacterium, while reducing the opportunistic pathogenic genus, Akkermansia. In addition, SYR treatment reduced the serum level of lipopolysaccharide-binding protein, an inflammatory marker, and enhanced humoral immunity against influenza vaccination to the level of young control mice. Taken together, these findings suggest that SYR may rejuvenate the immune system through modulation of gut integrity and microbiota diversity as well as composition in middle-aged mice, which may delay the immunosenescence associated with aging.